Students who apply to UMAP exchange programs for Inbound/Outbound Japan are now eligible to apply for a special allocation of scholarships under FY2019 JASSO-MEXT Student Exchange Support Program! The Office of the Higher Education Commission (OHEC), Ministry of Education, Thailand in collaboration with seven Thai universities have launched the FEALAC Short Course Student Exchange Program 2019 entitled “Sustainable Development: Intercultural Business and Tourism in Thailand” during 30 June – 25 July 2019 in Thailand. Students will experience not only Thai culture but also cultural diversity in Thailand. Moreover, students will have a chance to see business environment as well as tourism and hospitality in Thailand and how Thailand manages creative and sustainable tourism. Importantly, all participating students will be able to get to know each other and understand more about FEALAC member countries. The call for applications of FEALAC Short Course Student Exchange Program 2019 has been opened until April 1, 2019 (UPDATE: The deadline for applications have been extended to April 19, 2019). Those who are interested are welcome to submit the application online here. For more information, please contact an officer by email, visit the Facebook page, or visit the website. Students who apply to UMAP exchange programs are now eligible to apply for a special allocation of scholarships under FY2018 JASSO-MEXT Student Exchange Support Program! 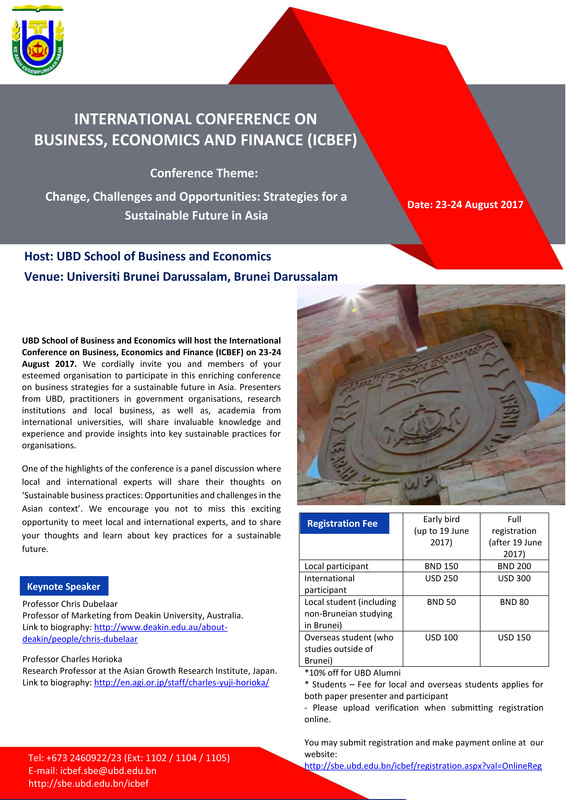 Invitation to The Future Forum 2017, Universiti Brunei Darussalam! Greetings from Universiti Brunei Darussalam (UBD)! Registration for participation is now open! The Southeast Asian Ministers of Education Organization (SEAMEO) is a chartered intergovernmental organization established in 1965 among governments of Southeast Asian countries to promote regional cooperation in education, science and culture in the region. SEAMEO develops and nurtures the capacities of teachers and school managers in Southeast Asia through its network of 21 specialist Centres that undertake training and research programme in various fields of education, science and culture. In order to provide excellent chance for a directed learning experience in regional and international platform for the students through practical work assignments at our SEAMEO Centres and the SEAMEO Secretariat, SEAMEO has launched “SEAMEO Internship Programme for Students” with an aim to nurture young people and to better prepare them for an increasingly globalized world. We would appreciate it if you could please help promote the SEAMEO Internship Programme to your students. For further detailed information and conditions on the Internship Programme, please visit SEAMEO Internship website at http://internship.seameo.org. For the students who are interested in participating in this programme, please register and fill in the application form at http://internship.seameo.org/registration within 30 June 2017. Thank you very much for your kind consideration and support. The University of Mindanao had successfully conducted a one-day conference on internationalizing higher education institutions and UMAP orientation last October 12, thereby educating participating school officials about the nature and ropes of internationalization in academic institutions.